ComEd customers that use electricity provided by ComEd or natural gas provided by Nicor Gas for the majority of their home’s heating may be eligible for the following instant rebates such as attic insulation, air and duct sealing, and foundation sidewall. Click here for a listing of these rebates and how you can receive them. Or you can call an approved contractor at 855.433.2700. The CEDA Weatherization Program is now open for residents of Chicago and Suburban Cook County to apply for our Home Energy Conservation Services. Their mission is to work in partnership with communities, to empower families and individuals to achieve self-sufficiency and to improve their quality of life. Please visit www.cedaorg.net for more information. · Grants of up to $1,500, once every two years, for eligible residential customers with household incomes up to 250 percent of the federal poverty level ($58,875 for a family of four) are available. Through April 1, 2014 customers are NOT required to provide additional hardship documentation to qualify. Open enrollment for the Emergency Heating Repair Program runs from Nov.1 thru April 1. To initiate the application process, homeowners can call HED’s customer service line at 312.744.3653 or visit City Hall, 121 N. LaSalle St., Room 1006, between 9 a.m. and 3 p.m. Monday thru Friday. You may also download the application packet, complete the forms and bring or mail them to the City Hall location. Completed forms with all required documentation must be dropped off in our office or postmarked by April 1, 2014 to avoid cancellation. Eligible properties must be located in Chicago, habitable, owner-occupied, and not at risk of foreclosure. All applicants must be income eligible and can only receive a one-time service for roof and porch repair/replacement. Exception to the one-time assistance policy may be granted to homeowners who face heating emergencies even though they already have received roof or porch assistance. Households earning 80% or less of the Area Median Income (AMI) are eligible to participate in the program. The total gross income of all owners and other household members shall be included and may not exceed this limit. The gross incomes of all adults, 18 and older, who reside in the property, are included to determine income eligibility. If the owner sells, transfers title or no longer occupies the unit within one year of the grant, the owner will be required to pay back the grant in its entirety. When the Illinois General Assembly created CUB in 1983, it gave the nonprofit, nonpartisan organization a clear mission: to represent the interests of residential utility customers across the state. The statute directs CUB to carry out that mission by intervening in ratemaking proceedings before the Illinois Commerce Commission (ICC), in the courts and before other public bodies and by providing consumers with information and assistance regarding their utility companies. Percentage of Income Payment Plan (PIPP) – a monthly benefit under which customers pay a monthly amount based on their household income and natural gas usage. Customers should visit a local customer center or call the Community and Economic Development Association (CEDA) at 800-571-2332. Their rental agreement, in cases where utilities are included in the rent. Weatherproofing your home is simple and affordable and will make a difference in your winter heating bills. Programs are available to help low- and fixed-income customers with weatherproofing projects. People with financial difficulties are encouraged to take advantage of these programs to reduce their bills. 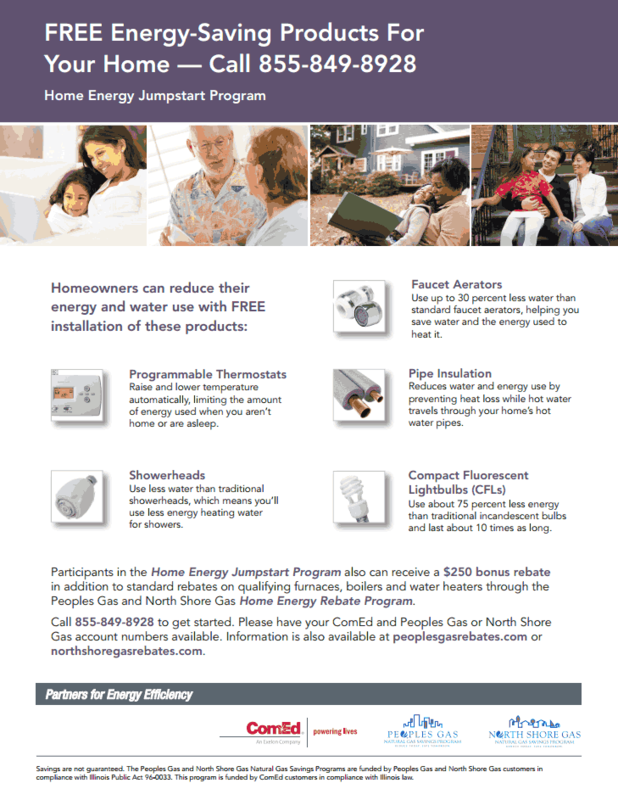 Provides eligible households with home energy audits, insulation installation and other weatherization services. To apply, call CEDA at 800-571-CEDA (2332). Roofing and unenclosed porch repairs. For more information, call 311, the city’s non-emergency information line. This program provides free minor home repairs to eligible seniors. This program enables elderly, low-income homeowners to maintain their homes for safe and comfortable living. Types of repairs include: light plumbing, replacing faulty light fixtures or switches, repairing or maintaining weather stripping and caulking, installing handicap access grab bars and railings, and other similar repairs. Participants must be at least 60 years of age and live south of North Avenue. Contact Housing Opportunities & Maintenance for the Elderly (H.O.M.E.) at 773-921-3200. H.O.M.E. repair staff will visit the person’s home to determine if the requested repair can be completed by the agency. To learn more about assistance programs for senior citizens, call 311, the city’s non-emergency information line. Once we receive your medical certificate and determine you are eligible, we will halt disconnection. Or, if your gas has already been disconnected, turn on your service. Be signed and dated by a registered physician or local board of health. Be on the physician’s letterhead and contain the name, business address and telephone number of the physician or board of health. State the name and address of the ill person (who must be a permanent resident of the premise in question). We will not discontinue service for 30 days from certification. Certification can be renewed once for an additional 30 days by providing a second medical certificate before the expiration of the first certificate. After two consecutive months (60 days), your account is ineligible for acceptance of additional medical certificates for one year from the date of the original certification. You must call 866-556-6001 and enter into Payment Arrangements within 30 days of the issuance of the certificate. No initial payment is required. If you have any questions regarding the Medical Certificate Program, please contact us. We understand circumstances sometimes make it difficult to keep up with your bills. That’s why we offer a Short-Term Payment Plan and Minimum Payment Option to allow customers to maintain service while they pay off past-due balances. The Short-Term Payment Plan helps eligible customers catch up on their bills over several months. The plan allows you to pay a portion of your past-due balance while paying your current bill. The sooner you contact us, the more likely we’ll be able to make arrangements that work for you. You are a residential or small business customer with an active account. Your request to enroll in a Short-Term Payment Plan can be denied if you still owe money on a previous payment plan with us. If you do not make the payments under your Short-Term Payment Plan, your service may be disconnected. If you are not eligible for a Short-Term Payment Plan and are facing service disconnection, you can maintain service by making a payment under the Minimum Payment Option. The Minimum Payment Option is offered from April through September to customers who receive a disconnect notice. You do not need to formally enroll or contact us to participate in the Minimum Payment Option. If you receive a disconnect notice, simply look for the Minimum Payment Option amount on the notice and follow the instructions on how to make your minimum payment. A Rate Relief Program has three components, the Summer Assistance Program, the Residential Rate Relief Program, Power Up, and Residential Hardship Fund. All of them offer some type of assistance with paying utility bills or heating bills to lower income Illinois residents. CARE Helping Hand Initiative is a new utility bill assistance program that was created to provide one-time assistance to provide some immediate help and relief to customers who are currently facing disconnection of their utility service. Illinois customers need to agree to a payment plan, and ComEd will waive a portion of the outstanding energy bill. Get information on other ComEd assistance programs. The energy company also uses millions of dollars of its own money every year to help low income and disadvantaged customers. So called matching programs and other resources are offered for paying electric and utility bills. Learn more. Do you have a financial hardship due to job loss, illness, military deployment, disability, or as a senior citizen? If so, you may be eligible for assistance through ComEd’s Residential Special Hardship program. Income-eligible, residential customers can apply once every two years for grants of up to $500 based on need and availability of program funds. This grant is available to residential customers with household incomes up to 250% of the federal poverty level ($59,625 for a family of four) who demonstrate a hardship – job loss, documented illness, military deployment, senior or disability hardships, among others. This option may be available to ComEd customers who receive traditional LIHEAP benefits. ComEd customers who participate in PIPP are not eligible for the Residential Special Hardship program. 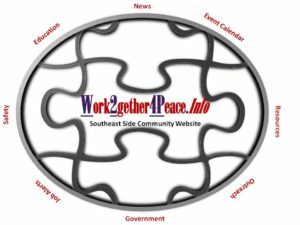 To apply, contact one of the local Illinois Association of Community Action Agencies (IACAA) listed in the following link. Benefits are available to eligible customers on a one-time basis. Please use the Single Parents Alliance qualifier tool provided below, to see if you are among the 20 Million Single Parents in America that are Eligible. 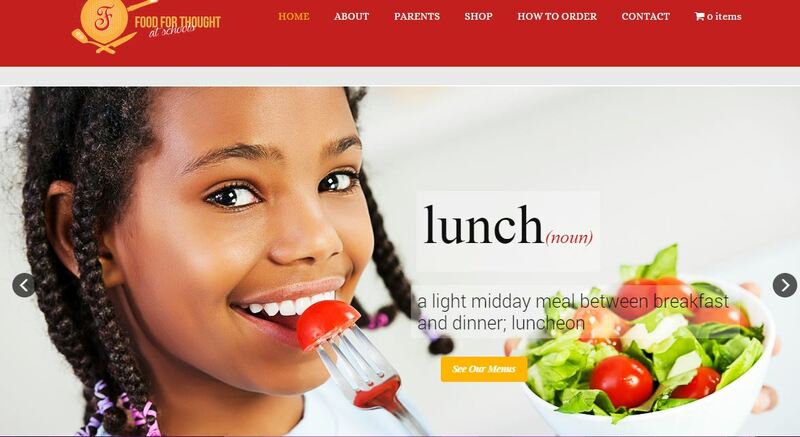 SPAOA.org is a for profit website comprised of information and resources for Single Parents across the United States. SPAOA.org is dedicated to the purpose of supplying third party offers and information for Financial Aid, Advice and Services for Single Parents. SPAOA.org efforts on behalf of its third party affiliates bring Benefits including, but not limited too, medical benefits, financial aid, grants, discounts from Groceries to Clothing Departments; as well as, further education financial benefits, and serves as an industry forum for information and resources for Single Parents across America. We also include a full forum for Members for support and advice. How can I get services? Contact a Homeless Prevention Provider from the list. 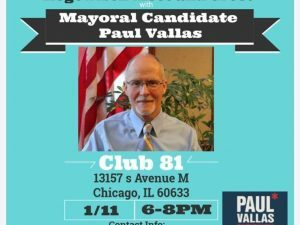 Hegewisch Meet & Greet with Mayoral Candidate Paul Vallas.